Step through the door of this restored 1720's farmhouse's and into the kitchen of the Selah Lester Farmhouse where you will find Mrs. Lester stoking the fire in the kitchen's cast iron stove. 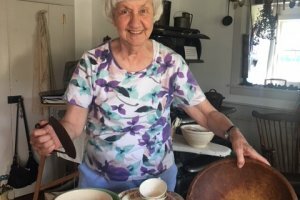 You'll be invited to follow her and ask questions as she goes through her day -- from baking bread to washing the family's clothes to tending the herb garden and cooking dinner for her husband and 7 children. This will be a fun-filled interactive experience where children and adults can try out old-time kitchen tools and touch antique house furnishings. Everyone is welcome to ask questions about women's daily life on the East End of Long Island's family farms during the 1880's-1930's. While taking a break from her chores, Mrs. Lester will take visitors to see the antique farm tools and equipment on display in the restored barn.